If a photo is worth a thousand words, thousands of photos will tell you the whole story. When computer forensic investigators start their examinations of computers and cell phones, one of the first things they do is scour the pictures. PicTrace is a combination of a quick picture examination tool for Windows computers, Androids, and iPhones as well as a fast and easy tool to backup your photos. Getting photos from your phone to your computer can be difficult for many people. PicTrace is the easiest way to backup your phone's photos. 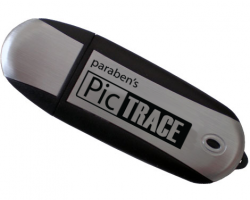 Pictures are stored directly to the PicTrace USB drive which means even if your computer hard drive fails, you have a backup of your pictures. Best of all, there's no cloud service & no monthly fees. PicTrace also backs up phone app photos from Instagram, Facebook, Viber, Whatsapp, and Wechat. This means all of your favorite photos saved by these apps can easily be investigated and backed up to your PicTrace.